An innovative Anglo-Finnish research study aimed at improving drug rehabilitation treatment for opioid dependent patients has begun, thanks to European funding worth almost €1 million. The two-year project, which will involve the trial of a rapid, non-invasive fingerprint drug screening technique, is part of a joint venture between UK-based Intelligent Fingerprinting Ltd, addiction medicine experts at the University of Eastern Finland and Addoz Oy, a Finnish healthcare technology company. The project has been made possible thanks to a grant of nearly €1 million from Eurostars, a programme that provides funding for key research and development initiatives within SMEs across Europe. The collaboration brings together expertise in key areas related to drug rehabilitation and the project will focus on developing improved patient management tools to assist with the delivery of more cost-effective, convenient and safer opioid substitution treatment (OST) programmes for opioid drug dependent patients. Opioid substitution treatment involves the prescription of a regular dosage of opioid substitution medicine, usually buprenorphine or methadone, to patients with opioid dependence, such as heroin addiction. The oral medication is longer lasting and less euphoric than illegal intravenous opioid drugs and suppresses a patient’s craving for heroin. The project’s clinical validation study will take place at the Addiction Psychiatry Unit at Kuopio University Hospital in Finland, led by Dr Ulrich Tacke, Professor of Addiction Medicine. OST patients usually have to make frequent visits to their clinic or, in some countries, to a pharmacy to take their medication under observation. They must also provide regular urine samples for analysis to check adherence to the OST programme and avoidance of illicit drugs. A member of the treatment staff observes the collection of each urine sample to reduce the possibility of a patient adulterating or switching samples in order to alter their test result. 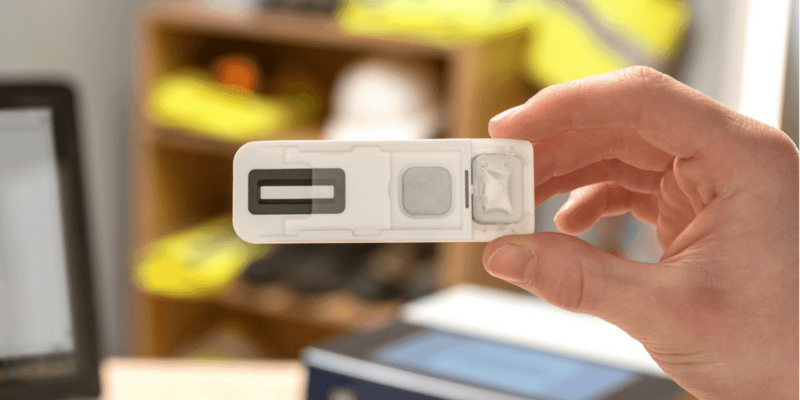 Intelligent Fingerprinting has invented a portable fingerprint drug screening device that can be used almost anywhere. 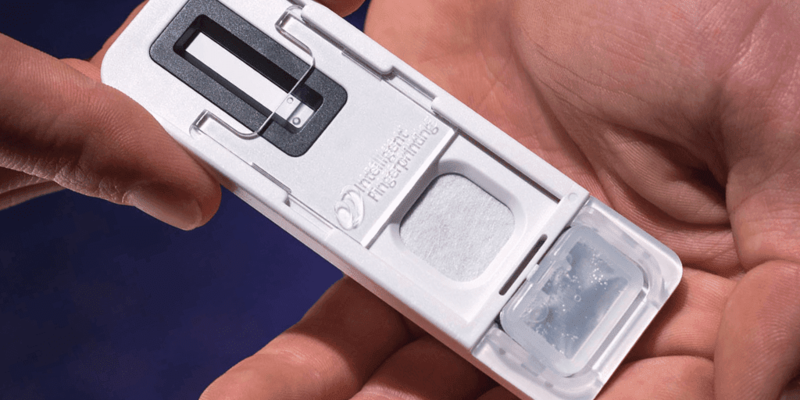 A single fingerprint sweat sample is all that is needed to carry out a multiple drug screen in less than 10 minutes. 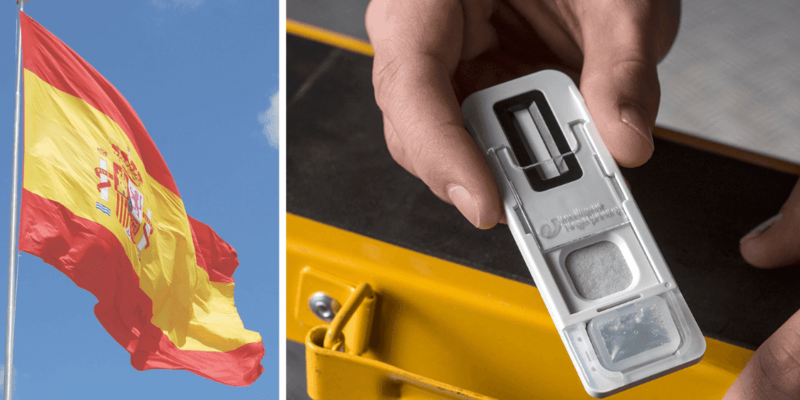 The device is safe and easy to use with no requirement for the costly specialist collection facilities and biohazard precautions associated with conventional testing methods involving blood, urine and saliva samples. Finnish healthcare technology company, Addoz, has a strong track record in providing innovative medical devices, such as the Med-O-Wheel SecureTM, which helps patients with their everyday medication dispensing needs. Their part in the project is to provide safe and cost-effective devices for use in OST. The Eurostars Programme received more than 500 applications from across its member countries for this round of funding. Out of all the applications, the Anglo-Finnish Fingerprint Recording in OST Project was ranked 1st in Finland, 3rd in the UK and 19th across the whole of the EU.